Neurotransmitters, brain chemicals that influence your mood and thoughts, facilitate communication between neurons in your brain. Your body uses the nutrients in the foods you eat, primarily amino acids, to manufacture neurotransmitters. Following general principles for good nutrition and eating a well-balanced diet will benefit your brain as well as the rest of your body. Still, if you are lacking in a certain neurotransmitter, you may wish to know about specific foods that contribute to the production of that neurotransmitter. Brown rice is a good source of the amino acid tryptophan, which is converted to serotonin when the body has adequate vitamins B1, B3, B6 and folic acid. Serotonin, a calming neurotransmitter, plays an important role in brain activities such as learning and memory. Serotonin promotes contentment and normal sleep. When serotonin levels in the brain are low, you may experience depression, insomnia or aggressive behavior. Other foods rich in tryptophan that will help increase serotonin levels include peanuts, cottage cheese, meat and sesame seeds. 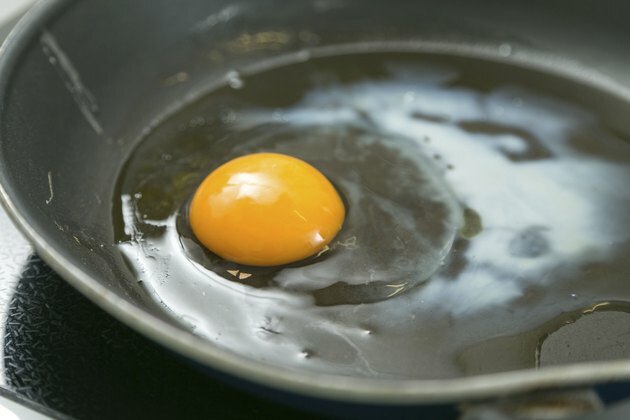 The yolks of eggs specifically contain choline, a building block for the neurotransmitter acetylcholine. Other foods that are good sources of choline include soybeans, wheat germ, whole wheat products and organ meats. Essential for thought and memory, acetycholine helps the brain store and recall memories, concentrate and maintain focus. It is also important for muscle coordination. Insufficient acetylcholine results in reduced cognitive capacity and memory decline. Milk, yogurt and cheese contain tyrosine, an amino acid your body uses to produce norepinephrine. Bananas, avocados, almonds, sesame seeds, pumpkin seeds and lima beans are other good sources. Norepinephrine is a neurotransmitter that facilitates alertness, concentration and motivation. The brain also needs norepinephrine to form new memories and to store them long term, the Franklin Institute explains. A good source of protein, fish contain the amino acid tyrosine as well. When tyrosine levels in the brain and blood are high, neurons also manufacture the neurotransmitter dopamine, which gives you a mental boost by promoting alertness and activity. Dopamine is important for healthy assertiveness as well as proper nervous and immune system functioning. Dopamine is easily oxidized, so eating plenty of foods with antioxidants, such as fruits and vegetables, helps protect the dopamine-using neurons. A cup of cooked spinach contains about 200 micrograms of folic acid, which is necessary for the body to make use of certain amino acids. By getting enough folic acid, you can help ensure your body will be able to synthesize norepinephrine and serotonin. Perhaps this is why folic acid deficiency has been linked to depression in some clinical studies, according to Middle Tennessee State University. Orange juice is another good source of folic acid. What Natural Supplements Raise Serotonin?